It is 3 in the afternoon on Saturday, July 2nd and team Vicious and Delicious have moved in to our Barrels. 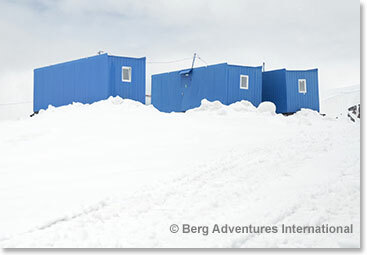 We are staying in blue rectangular Barrels that we visited yesterday when we came to check this place out. It is really pretty sweet, is quite cozy. We have 6 Vicious and Delicious team members in one Barrel and we have the guides in another and we have a kitchen and dining area yet another. This morning when we came up to the Azau lift to begin our ride up here we pick up Leila, our cook, and many, many boxes of food that have been purchased for this trip. Karina’s husband, Timor, came up with us to help us move the boxes and get Leila’s kitchen stocked well and it is a beautiful day. 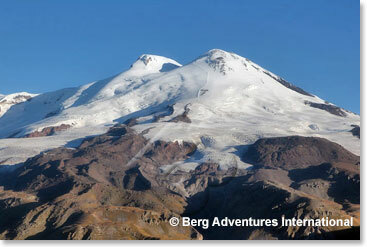 Elbrus’s twin summit has been before us in clear skies all day, it’s been an inspiring sight. I see some clouds moving in now; we are not finished yet for the day. We had a great lunch prepared by Leila and now we are going to go for another short acclimatization hike up to snow above to Garabashi or the Barrel sight then we are going to come down and do some crampons adjustments to make sure they are fitting our boots well so it is ready to climb higher, and train higher on the mountains with our goal being the summit in a few days. Vicious and Delicious is doing great and it is good to be up here at the barrel and finally in place to acclimatize fully and make a summit attempt.